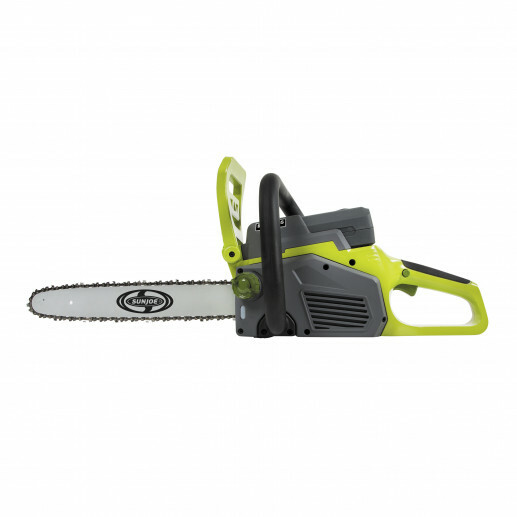 Sun Joe Cordless Chain Saw 40V 16 " - Re-manufactured Product Description CUT OFF. Tackle tough cutting jobs with the newest addition to the iON tool series – the Sun Joe® iON16CS cordless chain saw! Powered by the same interchangeable 40 V EcoSharp® lithium-ion battery system utilized by the other iON tools, the iON16CS delivers up to 40 minutes of whisper-quiet run time with zero carbon emissions for cleaner air. This cordless dynamo is also engineered with a powerful 600 W brushless motor for increased battery efficiency, optimal motor performance and extended motor life to keep your iON chain saw sawing strong season after season. 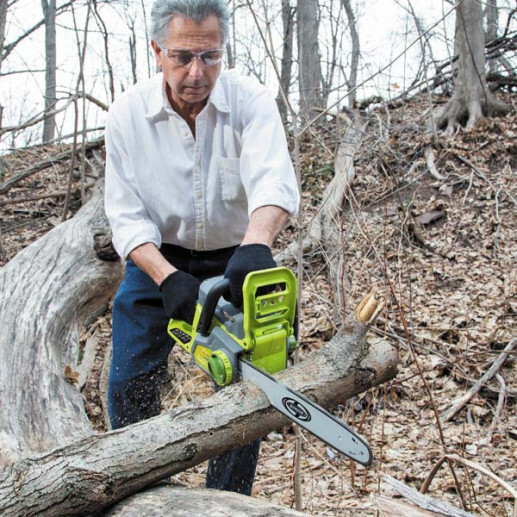 Ideal for cutting thick limbs, firewood, logs and branches, the iON chain saw starts instantly with a simple push of a button and its lightweight, ergonomic design (only 12.8 lbs!) maximizes user comfort during use. Featuring a self-lubricating 16-inch Oregon cutting bar and chain, the iON chain saw can easily saw through the most stubborn tree limbs, up to 14.6-inches thick! And, its tool-less chain adjustment system makes operation virtually maintenance free! Safety features include a hand guard with kickback brake, a protective sheath for safe blade storage, and a built-in safety switch to prevent accidental starting.